Blue marlin (Makaira nigricans) stock status varies among ocean basins, and the Atlantic-wide stock is overfished. United States regulations prohibit commercial landing, importation and sale of Atlantic blue marlin, but not of Pacific or Indian Ocean conspecifics. We genotyped 344 blue marlin of known origin and 16 samples used as unknowns at 13 microsatellite loci and the mitochondrial control region. Assignment tests were conducted using GENECLASS2 to investigate the efficacy of available genotypic data to identify individual origin. 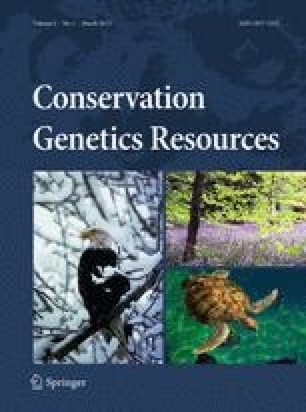 We successfully discriminated Atlantic and Pacific blue marlin using genetic characters, providing more power to assign marketed blue marlin products to ocean of origin. Research was supported by the National Marine Fisheries Service Award NA08NMF4000676 (JRM & JEG). We would like to thank all of our collaborators who provided samples, and Special Agent Lynn Rios for support in Puerto Rico.